Housing located in Genalguacil, authentic village museum of the Genal Valley. Ideal for couples with the possibility of an extra bed for children. It has a bathroom with hydromassage bathtub and separate shower Hydromassage, fireplace, full kitchen .... in short inviting to make you feel at home. The house has two floors, ground floor type Loft with three different spaces, living room, dining room and large kitchen. Upstairs with bedroom, large bathroom with hydromassage bath and terrace to enjoy the good temperatures of the Serrania. It is decorated with all our love and illusion. Great cottage full rental, with spacious loft but differentiated rooms. On the ground floor kitchen, dining room and living room; upstairs bedroom, large bathroom with whirlpool bath and hydromassage shower. 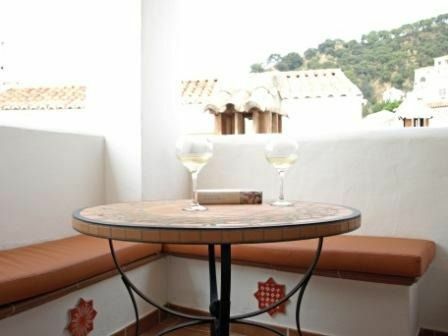 Terrace with great corner to enjoy the pleasant climate of the Serrania. 1) The property details, mention a 'Hot Tub'. This was not a 'Hot Tub', as we know - but a spa bath instead. This was one of the reasons why we chose this property. 2) On the following day of our arrival - the gas bottle ran out, forcing us to contact the owner and get the cleaner to come and change the gas bottle over. We feel that this should have been checked before we arrived, for a months stay. 3) No kettle, to boil a cup of water for tea - therefore used the microwave - which when used with other appliances (e.g. cooker, lights and electric heater), kept tripping the fuse box - no power while it reset itself. On a more positive note, property was clean, bed was comfortable and village was welcoming. Los pocos días que hemos pasado en la casa han sido maravillosos e inolvidables. La casa tiene todo lo necesario, una cocina perfecta para hacer todo lo que te apetezca, tiene un maravilloso salón con una chimenea para los días de más frío y en la planta superior el dormitorio, un pequeño baño con una maravillosa bañera de hidromasaje perfecta para relajarse y un pequeño balcón donde comer los días de mejor tiempo, en resumen una casa maravillosa.